So much has been going on! It’s a hard time of year to keep up with all the notices, emails and with the holiday swirl, its no wonder so many of us are strapped for time. But every voice raised for our children matters. Every email, letter, blog post, or conversation we have about the issues facing our schools, our children, and our teachers–brings us one step closer to creating change in our community. So, it’s up to us, parents. It really is up to us to stand up and be heard. And when we can see the positive results of our actions, as you’ll read below, we know there is strength in numbers. Every single one of you that steps up to the mic at a BOE meeting, or sends an email, or shares a post on Facebook, or does a bit of research and shares it with a friend — is part of a collective —PARENT POWER! Your advocacy has made a difference. The fact that the board has put this on the agenda is entirely due to your making your concerns heard at board meetings and through other communications. Now it is important that the board pass this resolution. Please come to express your support. The board needs to hear from parents! What to do: You can sign in before the meeting to speak. Just come to show support for the resolution. Bring a friend. Forward this email to other parents. “[S]ome parents may choose to have their children decline to take one or more of [the PARCCs]. This is important because it would mean that parents who decline to have their children take the PARCC would not have to worry that their children would be forced to “sit and stare” during testing times. Instead, the district would respond in an “educationally appropriate and non-punitive” way, such as by having the children engage in productive alternative activities in another room. Other school boards have passed parental refusal resolutions, including those in Bloomfield and Delran, with parents in communities across the state calling for similar measures. The PARCC is a brand new test, and Montclair Public Schools need a consistent, clear policy that addresses what students who refuse the test will do while the test is being administered. Parents have been asking for months for a humane policy. Come lend your voice in support of this important resolution Monday night at the MHS auditorium. Why are so many Montclair and New Jersey parents considering refusing the PARCC tests for their children? Testing overkill — long sessions spread over two testing windows each year, one 3-week window in March, one 2-week window in April – May. This is more testing hours for children and high schoolers than needed for college grads for the LSAT, GRE, GMAT, etc. The potential for the setting of unrealistic and punishing cut (passing) scores such as has occurred in other states where failure rates on new tests have been as high as 70 percent. The NJ Department of Education will set the cut or passing scores next year after students have taken the tests, raising concerns that they will set the cut score at a level to produce whatever passing or failure rate they want. The squandering of billions of dollars of education funds in New Jersey and nationally to computerized testing. Judge the test for yourself. For a deeper discussion of these issues, please visit Montclair Cares About Schools on Facebook. A copy of the resolution can be viewed on MCAS Facebook, or at http://www.montclair.k12.nj.us/WebPageFiles/44/141215.pdf. The resolution is on page 43 of the PDF. Many of us will be at the BOE meeting tonight and we hope to see you there! If you like this blog, please share it with a friend or neighbor. The movement is growing every day. Thanks for doing what you do. 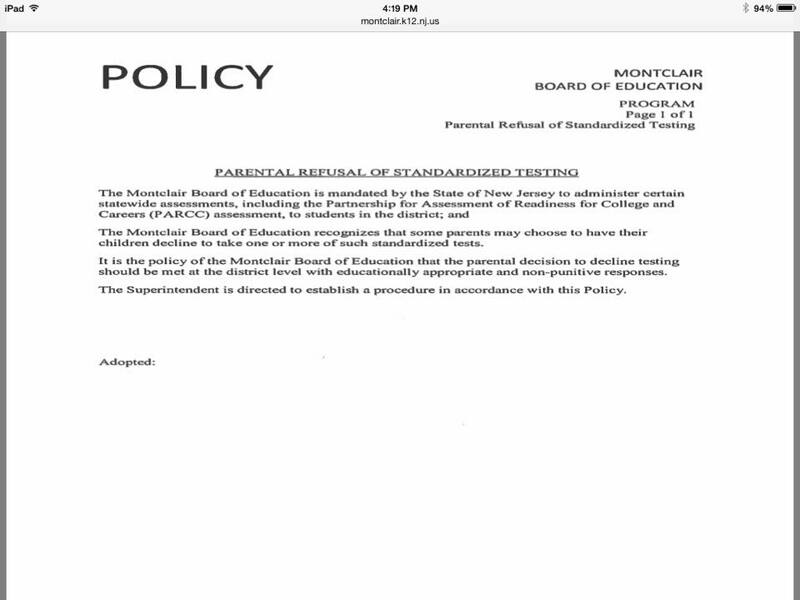 This entry was posted in Elementary School, High School, Middle School, Montclair, New Jersey, Opt Out-Refuse the Tests, Take Action and tagged high stakes tetsting, humane opt-out, Montclair BOE, opt out policy, PARCC, PARCC propaganda, parent refusal, proposed resolution, vote. Bookmark the permalink.